I’ve got early stage MS. I know I need to exercise, but I don’t know what to do. MS can be a very cruel condition with an outlook which is less than optimistic, but what can you do to minimise the impact of the illness? In the following text I hope to show you what to do and why it’s important that you get it right. Firstly, exercise for someone with MS is as important, if not more important than it is for everybody else. I say that, but really it is far more important. You need to do it right because I see far too many medical professionals telling people who have recently been diagnosed with MS that they need to “exercise” without any guidelines on what type of exercise to do. Without the right guidelines, many people head straight for the treadmill or the exercise bike. This seems logical but it’s not where your focus should be. Don’t get me wrong; cardiovascular exercise is as important for somebody with MS as an individual without, but the areas which need most attention are strength and hypertrophy (a term used to describe increases in muscle mass). Whether you have remit/relapse MS or progressive MS, the effects of both can be controlled to some degree with a good weight training regime to encourage muscle growth/maintenance and in turn strength gains/maintenance. I say gains/maintenance because at times you may be gaining strength & muscle mass and at other times it may be about limiting the loss of strength and muscle mass. Why weight training over cardio? Cardio vascular exercise or cardio for short, is a term used to describe a workout for the heart (cardio) and blood vessels (vascular). The heart works hand in hand with the lungs so consider it a given that increasing the strength of your heart and circulatory system will increase the strength and performance of your lungs. Cardio can consist of any exercise as long as that activity requires enough fuel to increase the heart rate to a level at which it is not used to performing. A common misconception is that cardio means only running, cycling, cross training or other such repetitive movements. All of those forms of cardio require good leg control but if you have MS you may not have good leg control. That’s not to say that you can’t do cardio though. Remember, I said that cardio is any activity which encourages a high heart rate. It’s often more about how you perform the exercise than the type of exercise you do. For example, perform a range of upper body weight training exercises in a row without breaking between sets and your heart rate will go through the roof! Yes, a healthy heart and lungs is good for anyone, but with MS the real challenge lies in keeping the limbs and core strong enough to perform everyday tasks. The best way to do this is through weight training or what we call in the industry resistance training. Cardio will offer mild strength gains in the areas of the body which come under the most stress but lifting weights or resistance training will offer far better results when managing every day activities is your goal. Again, the above is still too little information to really help someone who is just starting out. We need to look at what areas of the body to work, how to work them and how frequently to work them. Weight training can be done in many different ways to work towards many different targets. So we need to focus on using strength and muscle gain techniques in the gym or home or whatever environment you choose. What you do may also vary depending on which part of the body you’re working, and how much control you have over those muscles. I’ll try to make the following explanation as simple as possible. In my opinion, the first rule of weight training is that you should always be chasing. That may sound like a quote from a sales bible, and it probably is, but its true in the gym too. By this, I mean that you should always be trying to do more than you can currently do. The body doesn’t just get better at stuff unless you actively try to get better at stuff. A simple example would be to say that if you can lift a 10kg weight ten times, you should be trying to lift it 11 times, or trying to lift 11kg ten times. If you can do that, it’s too easy so you should be trying the next level up. You keep chasing until you reach the point where you can’t achieve what you set out to do. Once you reach that point, you keep trying until it becomes possible. This is what makes our bodies change. They respond to the stresses we put upon them. If you’ve just been diagnosed with MS or are experiencing it in its early stages you’ll want to focus on increasing strength and muscle mass so that if and when it does hit that particular area, you are starting from a higher place, thus reducing the deterioration of strength and muscle mass. Any muscle which isn’t being used reduces in size quickly and significantly. If a neurological disorder strikes to the point where muscles can’t be controlled, those muscles will shrink. We call this atrophy and with atrophy comes further reductions in strength. If the neurological control comes back, the muscle remains in a weaker state due to its reduction in size. So by starting with bigger and stronger muscles, the loss in size and strength will be offset slightly compared to someone who already had small and weak muscles. So build muscle mass and strength during the good times. Keep working the muscles as much as possible during the bad times and focus on regaining strength during remission periods. Avoid passive exercises as they are likely to be a waste of your time. By “passive” I mean exercise machines which do the work for you. If you are on an automatic bike which is moving your legs for you, it’s not helping you get stronger. 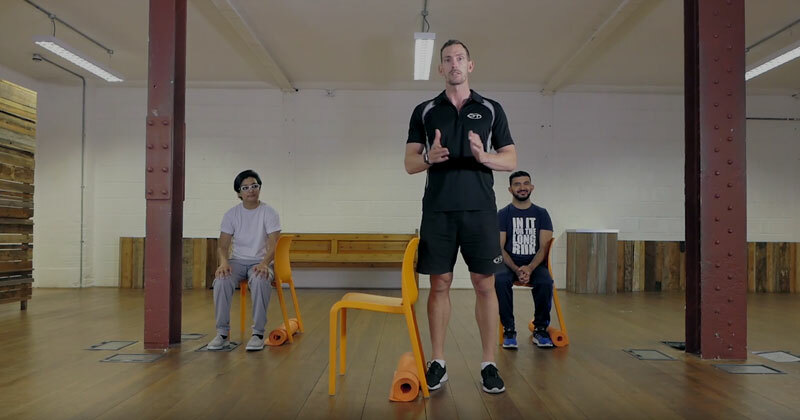 If you are in a standing machine which holds you in an upright position, it’s doing the work for you, not helping your muscles gain the strength you need in order to stand up. You need to be doing exercises where YOU do the work. You need your own neurological system to be making your own muscles contract. That’s the only way to make progression. There is one exception here which is the electronic muscle stimulators. These cause your muscles to contract by sending an artificial signal to the muscle. This will help the muscle but not necessarily the neurological system. Only worth using in scenarios where you have absolutely no control of your own in order to encourage muscle growth. Functional movements which encourage stability are essential. The less we do the worse our balance gets anyway. Couple this with a neurological disorder and we’ve got problems. So think about what kind of movements require stability as well as strength because the way the muscles work for each discipline are different. Lunges, single leg deadlifts, kneel-to-stand are all good examples of exercises which will challenge you in terms of balance. Adhere to the above rules and you’ll really feel the difference.